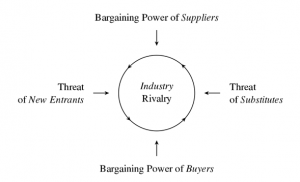 If you’ve taken any sort of business course, you’ve likely heard of Michael Porter’s five forces analysis on competition within an industry. These forces represent the competitive nature and profitability of an industry as a whole – taking into account all influencing factors. The power of buyers and suppliers and threats of new entrants or substitutes shape a given industry, which are often overlooked by entrenched competitors. 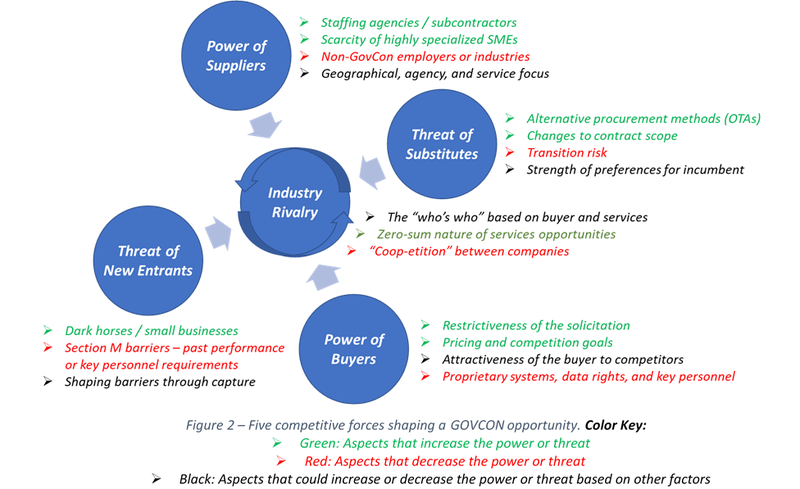 Figure 1 – Porter’s five forces governing competition in an industry. Without going into significant depth on Porter’s analysis and findings (Harvard Business Review, March 1979), we can leverage this model to look at government contract opportunities. Using this model on an opportunity-by-opportunity basis with some slight tweaking allows us better assess a company’s competitive position and their probability of winning a contract. Consider the fundamentals of Porter’s Five Forces model framed more specifically to GOVCON. This analytic tool, originally intended as a framework to help understand the competitive forces at play in an industry, can also be leveraged to help understand the forces influencing competition for a given contract opportunity. Note the added definitions in Figure 2. Understanding these forces can help better understand the full scope of a government contract opportunity and allow your company to develop strategies and discriminators that address the entire competitive environment, beyond just the competitors. Read on below for a more expanded explanation of details. The center circle in Figure 1, Industry Rivalry, is what we typically assess in a competitive analysis and Black Hat review – the “who’s who” for a particular opportunity, influenced by factors such as the customer or the required services. Intensity of this factor varies based on the attractiveness of the opportunity. We have a fairly unique aspect to this factor in GOVCON through “coop-etition” – partnering with a company on one deal while competing against them on another separate opportunity. As the services side of GOVCON is often a zero-sum game, competitors will team with each other if the situation warrants and it increases their chances of winning. Suppliers can be seen through the typical lens as suppliers of physical components, but could also be staffing agencies and subcontractors (i.e., labor brokers). Focused, geographically-clustered companies have a strong understanding of local labor markets, customer decision makers and influencers, and the competitive environment. They may also have key personnel or subject matter experts who the buyer wants on contract. These “insider” companies are frequently sought after by larger “outsider” businesses and can demand greater workshare. In an area like Omaha, NE, supplier bargaining power is high but in an area such as Washington, DC, where many companies are clustered supporting a variety of customers, supplier bargaining power is weaker. Let’s not forget about the individuals, themselves, who are suppliers of their capabilities. While some skill sets are fairly easy to staff (e.g., administrative, acquisitions, lower-level IT), others are much more difficult (e.g., cleared, certain engineering disciplines, system experts), thus increasing the individual supplier’s power. Additionally, as technology companies such as Google and Amazon move into new cities, the demand for technical talent will increase, providing individuals the opportunity to supply their skill sets outside of GOVCON. The Buyer is the government agency – more specifically the offices, programs, and personnel within the agency. In developing a solicitation, the buyer has significant influence over the opportunity and competitive environment, setting barriers to entry and swaying pricing decisions. By providing a more open solicitation with general requirements, the buyer can increase competition and decrease prices. Conversely, they can eliminate competition through a very restrictive solicitation or the use of a contract vehicle. This allows the buyer to focus an opportunity on their desired outcome – lowest cost, innovative solutions, use of a specific provider or technology, etc. While buyer power seems strong, it can often depend on the competitors – the importance of the customer to the competitor, the attractiveness of the opportunity, and the customer’s situation. For some acquisitions, a competitor might “no-bid” and walk away from an opportunity, decreasing the buyer’s power. However, if the agency is of strategic importance to a competitor, they are less likely to no-bid, increasing the buyer’s power. If the opportunity is unattractive to competitors, the buyer will have less bidders and thus less power. The customer could also be in a situation where only one competitor can complete the work (proprietary systems, ownership of data rights, removal of incumbent personnel, etc. ), drastically reducing their power. New entrants can seemingly come out of nowhere to win a contract. These companies may be dark horses, smaller businesses trying to grow, or established companies expanding in “same customer, new service” or “new customer, same service” situations. Opportunities without clear favorites or those undergoing changes in scope are more attractive to new entrants. Section M can also be a barrier to entry, dictating the evaluation criteria and requirements. Heavy requirements for past performance or overly-restrictive key personnel requirements create significant barriers to potential new entrants, while looser evaluation criteria would create a more welcoming competition. Solicitation through a contract vehicle (acting as a distribution channel) would also prevent new entrants by limiting the competitive field. The competitors can shape Section M or contract vehicle usage during the capture phase to increase or decrease potential barriers to entry. In GOVCON, the threat of substitutes may be derived from various aspects. One major threat is the procurement method (which yes, can blur the line between the power of buyers, who set the procurement method). Alternative procurement methods may include use of Other Transactional Authority (OTA), changing the nature of competition through a set-aside, using procurement innovation labs, or insourcing work from the contractors. A similar substitute threat would be a fundamental change to contract scope (although this is more of a threat to an incumbent, while potentially giving competitors a better opportunity). Threat of substitutes is also affected by the buyer’s “brand loyalty.” Some agencies are not very preferential to incumbent companies (NASA is an example for being fickle), increasing the threat of an outsider presenting a new solution. More insular communities, such as the FAA, have lower threats of substitutes as their contracting communities are fairly rigid. Similarly, switching cost (i.e., transition risk) can impact the threat of a substitute. The time, cost, and risk for a new company to become operational may be too significant for the buyer to switch. While we may do an eye roll (perfected by teenagers everywhere) at the suggestion of MBA-speak and concepts such as Porter’s Five Forces, adding this into your opportunity analysis may serve you well.